I look forward to feeding the outside cats every morning. I'm not usually a morning person, but these days, I don't want to miss an opportunity to visit with Oliver and his precious family. This weekend I was in for a treat. On Friday morning when I went out to serve the boys breakfast, Pierre came up to me when I was dishing out the wet food and head bonked my hand! I couldn't believe it! Pierre loves to head bonk Oliver and this time he did it to me! On Saturday, he did it again and then proceeded to start eating out the bowl of wet food, like Oliver does, before I was was done dishing out all the food. I decided to take advantage of the moment and reached out and gave him some pets. I was in heaven!! After about four pets he moved away. Progress! Meanwhile, construction continues on Oliver's new palace. 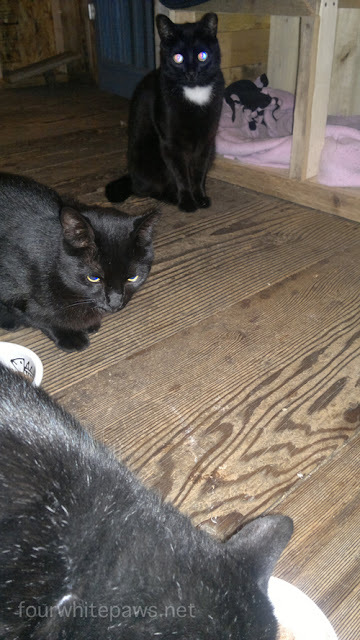 Sunday night was the first night it was made available for the cats. I put Oliver up to it so he could explore, which he promptly did. Creating the palace was part of a bigger house project. Most of the kitty portion of the project is complete, but there are a few things yet to do for the entire project to be done. Hopefully, just another day or two of work and it will be done. I'll share some pictures once the project is completely done. Yay, Pierre! Progress indeed. You must have been over the moon with joy! WOW - that is great news. Will look forward to seeing the new kitty castle. That is progress! What a wonderful feeling that must have been. We look forward to seeing the new palace. OH that is such good news about Pierre. I know it makes your heart sing and there are more good things in the future. Way to go Pierre. The idea of a kitty castle sounds interesting. Looks like you are being accepted more and more over time. That is good news. Aren't kitty head bonks the best? LOL! Too cute! Oh surprise head bonks are the best bonks EVER! Can't wait to see the outdoor kitty kingdom when its done! I think headbonks are THE best! I love the ones I get and Pierre's were just over the top wonderful because he trusts you now. That is just a feeling beyond happy when a kitty trusts you. Oliver must have talked to him. I am bustin' to see the Palace. Hooray for head bonks from Pierre! !